A smithing mod tailored to my desires in the game. Adds the ability to forge arrows, gain skill for smelting and mining, melt down unwanted armor and weapons, and more. Ars Metallica Patches Will be required for all files on this page. Crafting feathers were not available on hanging pheasants due to overlooking them when porting the mod to SSE. Constructing the Thieves Guildmaster Hood was not using the improved Thieves Guild Hood like it was supposed to. The recipe was incorrectly looking for boots. Dwarven ingots made from the smelting recipe from the unofficial patch will no longer cause duplicate menu entries to appear. Making ingots out of iron daggers will now require two daggers instead of one. Making ingots out of ebony daggers will now require two daggers instead of one. Smelting an Ancient Nord Bow or a Honed Ancient Nord Bow is not supposed to provide Dwarven ingots. They should be steel. 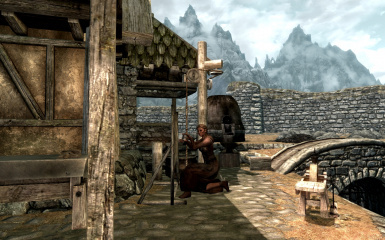 The crafting system is one of Skyrim's better features, but for thieves and archers, there's not much use for the system. Light armor is dead easy to come by in already finished forms, but arrows can sometimes be scarce in the types you may want. Lockpicks have been known to be somewhat scarce too, yet are relatively basic to construct. * Allow archers to forge their own arrows out of the various ore materials, wood, leather strips, and feathers. Indirectly making it somewhat useful to chop wood too. * Allow thieves to make their own lockpicks out of iron or steel. * Provide the ability to melt down existing pieces of armor and some clutter items into ingots so that you can then use those ingots to make missing pieces of a set if you want. * Allow members of factions to forge equipment appropriate to their guild. Thieves can make guild armor. Assassins can make Brotherhood armor. Legionnaires can make Imperial armor, and so on. * Modifies the dragonbone arrow recipes and the crossbow bolt recipes to conform to the same formulas as vanilla. Disabled Dawnguard's native recipes. 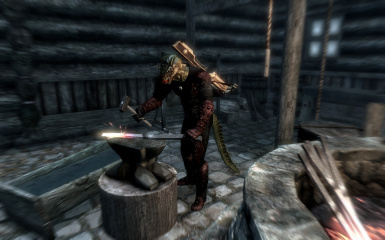 * Provides smithing experience for using the various workbenches used to construct your homes. The drafting table does not count since nothing is actually built using it. * Modifies the stalhrim and nordic arrow recipes to conform to the same formulas as the vanilla arrows. * Adds smelting formulas to recover ore from stalhrim and nordic carved equipment. * Adds crafting feathers to the Felsaad Tern. Note that all smelting of metals requires that you know the perk associated with that metal. For example, if you wish to smelt Dwemer scrap, you need to know the Dwemer Smithing perk first. This applies not just to smelting existing goods but also to smelting raw ore. This isn't a bug, it's a feature. Use the "Download with Manager" button on the Ars Metallica page at Skyrim Nexus. The installer should take care of things from there. Drop the Ars Metallica.esp and Ars Metallica.bsa files into your Data folder. To remove the mod: Delete the Ars Metallica.esp and Ars Metallica.bsa files from your Data folder. Then reload your game as usual. Silver swords and greatswords can be forged but they show up under the MISC category. Any mod that alters the vanilla mining script, MineOreScript.psc, will be incompatible. Any mod which alters the recipes for the vanilla ingot formulas will be incompatible. Any mod adding items to chickens, pheasants, dead hawks, or the DeathItemHagraven leveled list will be incompatible without Wrye Bash. Any Dawnguard mods that modify the arrow recipes, steel bolt recipe, or dwarven bolt recipe will be incompatible. The magic crossbow bolt recipes have not been altered. Any Hearthfire mods that modify the carpenter's workbench or the other smaller workbenches in each of the houses will be incompatible. Any Dragonborn mods that modify the two arrow recipes will be incompatible.